Billed as an adventure/horror game, Whispering Willows manages to build tension and atmosphere yet struggles to use it as the story about good people doing bad things never has the time nor the writing to deliver what the theme deserves. The creepy setting and endearing art-style do their best to hold up the experience but the short running time and awkward ending ultimately sabotage its own potential. Whispering Willows starts promisingly enough. Playing as Elena, a young girl looking for her missing father, you investigate an old private estate where the secrets of terrible crimes and horrific deaths are there for you to solve. You’re not alone though as your family pendant conveniently allows you to astral project your spirit into the ghost realm and communicate with those that have died. Though you only move in two dimensional the ability to transform into a spirit enables you to squeeze into small spaces, possess objects and talk to the spirits infesting the mansion you’re investigating. Puzzles are limited to flipping switches or finding precious objects needed by the deceased in order to move on into the afterlife. 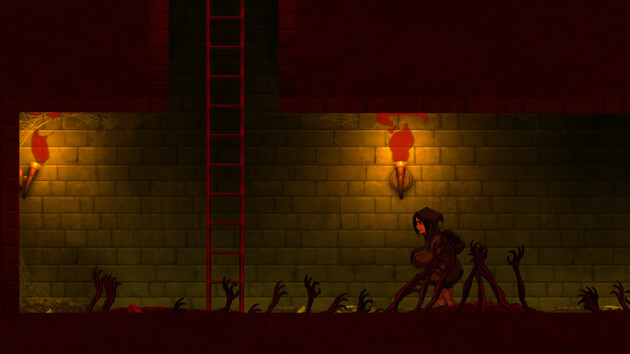 Threats come in the form of evil ghosts or spirits that insta-kill on touch along with some odd, giant cockroaches that can only be seen in spirit form. 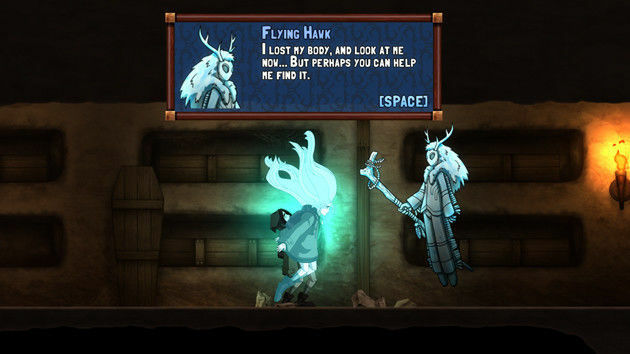 Whispering Willows isn’t about this pseudo-combat though, it’s about the atmosphere and story it wants to tell. Diary entries keep the plot moving and letters are strewn around locations filling in back-story for the characters and your father. This amount of reading material fits the style of game but many players are going to find it tough to wade through pages of material to get the most out of Whispering Willows. The ability of a game to tell its story through actions rather than info-dumping like this makes a huge difference to the experience and sadly Whispering Willows is tripped up by relying on this method too much. Nearly after every intense sequence a pop-up notice would tell me about a new diary entry and take me out of the experience by having to read a couple of pages of text. The small budget of the game obviously kicks in here but keeping that dramatic tension going and finding a way to communicate it without text would have made Whispering Willows so much better. There’s nothing stopping you from ignoring the notes or diary entries but as they are just as much of the game as moving left or right you have to invest in the fiction to make the experience worthwhile. Sadly that investment is lost once the last 15 minutes play out and I was deeply disappointed that the game’s direction and writing tried to wrap up something so meaningful and powerful as redemption in such a contrite and rushed way. The worst part of this finale is how it manages to tease a direction it could have had for the whole game, allowing you the brief opportunity to go back in time and right the wrongs of the past - however fleeting. 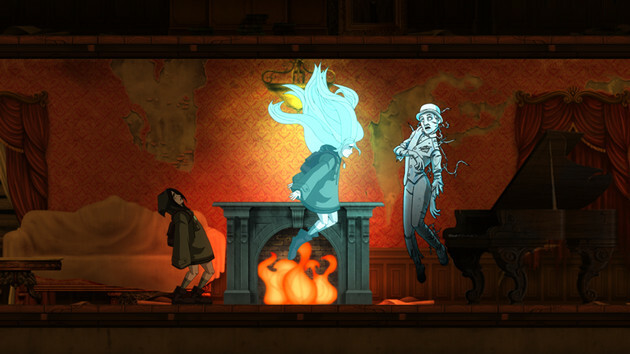 Whispering Willows does manage to convey the right atmosphere despite those fatal problems, doing a stellar job with its sound design. Gently increasing the tension at certain times, sometimes building up to a climax or offering up audible red herrings. Not only does the music do this but the quality of the ambient sounds adds tension and reality to the mix. The hum of electric lights will pass from ear to ear as you walk by them - a minor touch perhaps, but essential for placing you in the world of Whispering Willows along with its empty mansion, ghostly spectres and sense of loneliness. The story itself isn’t afraid to go into dark detail about the past of the characters you come across (in deceased form). The thin veneer of respectability is soon shattered as you uncover the truth about the owner of the mansion and the murderous path he cut through his life. Taking you back to the American Frontier most notes describe the meetings between natives and the whites from both perspectives. It’s a bit like reading a description of a car crash to be honest and this is one aspect of the game I wish they’d manage to show and not tell. That sentiment is no better demonstrated than by Whispering Willows’ conclusion where it manages to get a highly important character to perform a complete emotional u-turn in the space of a few text boxes and that time-travelling mechanic. I totally understand what the game is trying to do but at three hours running time at maximum, it leaves this twist far too late and the writing just cannot support such a radical move. The creepy sound design just before a rare jump-scare.